Below is a screenshot of what a virus would look like for a Mac(R) computer. 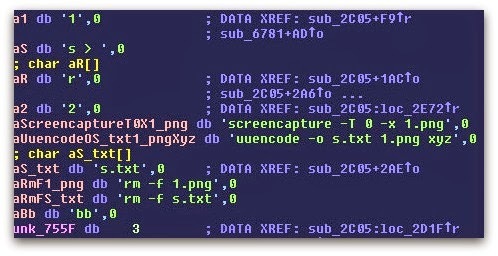 Above is a screenshot of a virus written for Mac(R). I know, "a Mac(R) can't get a virus". It's just not possible right. I've been programming for sometime now. Computer programming allows you to understand what is possible with a particular operating system and how often it could be hacked along with the software on it. These virus writers don't care about your fanboy fetishes, your love of Apple(R), or your bias toward Windows(R). I admit -- Windows is very unstable. However, it more stable then false security. I wouldn't ever recommend Windows to someone who is super-creative and has a work that the really can't lose. However, the false security that the Mac(R) gives it's user base allows hackers to break into your computer without any issues. I am not here to get technical about whether it is the Mac(R) operating system itself or the software on it that allows it to be hacked. We leave that to the people specialized in the profession. I am here to discuss the fact that it can acquire a virus and it has many out there that are running on computers all around the world. You must know your computer doesn't have to slow down for it to have a virus. The point of many of these malware infections is they are supposed to undetectable. So while you don't have any defenses on your computer you are very likely to have your identity taken by someone with just the virus program. I have experience with analyzing virus programs for Windows and Mac(R). I have experience programming applications in various programming languages. I am not an expert. I am just someone who knows what he speaks of. I consult people on this thing all the time online. They just hit up my Inbox and ask me questions because they find my articles so informative.